Choose from 6 hotels and guest houses in Anglesey. Shown below a just a selection of the hotels available. To search within an area please use the menu on the right. Just 4 minutes from Holyhead's ferry port and with fabulous views overlooking the marina, the Boathouse Hotel offers en suite accommodation, fresh food, a bar and free parking. On the edge of Breakwater Park, the Boathouse Hotel has a great location. All that Holyhead has to offer is within easy reach. You can enjoy a coastal walk from the hotel's doorstep. As well as the ferry port, Holyhead railway station is also nearby. For motor racing fans, the Anglesey Circuit is located in nearby Aberffraw, Anglesey. Free on-site parking is available for guests. The hotel has 19 en suite rooms, all of which have tea/coffee making facilities and TVs. The hotel's bistro offers a wide range of freshly prepared bar snacks and a specials board that changes daily. Locally caught fresh seafood and lobster are a speciality. Pets are welcome and the hotel is open all year round. 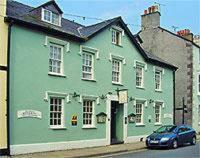 The Bulkeley Hotel is yards from the beach and pier alongside the Menai Straits. It enjoys stunning views across the water to the mountains of Snowdonia. Built as a Georgian show piece in 1832, the hotel now has 43 en suite bedrooms, a fine restaurant, coffee shop, Real Ale bar and lounge. All of the bedrooms are serviced by a lift and there are facilities for the disabled guest. For the business traveller, the hotel offers a full secretarial service, internet access in all bedrooms and meeting rooms for 2-150 people. The hotel can host civil weddings for you and make all of the necessary arrangements for your special day. The ballroom is regularly used for weddings and functions for up to 140 people. The Bulkeley Hotel serves 'a Taste of Wales' and prides itself on cooking the best of local produce creatively. With only 9 bedrooms this Georgian town house can offer an attentive, yet unobtrusive service, combining modern amenities with elegant antiquity. Antique furniture, glass and china collections adorn the tasteful interior, where you will find a comfortable wood-panelled guest lounge, ideal for restful coffee and liqueurs. Elsewhere, the on site restaurant is one of just 2 Anglesey hotels to have earned an AA rosette, with fresh local produce served daily to keep you refreshed and content.